​For some of us it is Hakalau School, 2nd Sunday, for some it is Cemetery Stewardship, 4th Sunday, for some of us it is FoodSHARE, every Tuesday, set-up/take down, for some of us it is Hakalau Jodo Senior Temple luncheon, once a week. For all of us it is being committed to service for others, and in doing so we are all transformed. Thank-you ever so much for helping build a community of folks who work together and who take care and love where we live. Photo of the 2nd Sunday Green Team, January 14, 2018, courtesy of Odysseus. We began cleaning up the grounds of Hakalau School in April 2015, and we continue every month. Our vision is the creation of the Hakalau Learning Center. Pending the results of an environmental assessment, Hakalau School will be returned to the State (DLNR), and then Wailea Village Historic Preservation Community and the State will enter into a long-term lease, and the Hakalau Learning Center becomes REAL. We are thoroughly blessed indeed by the spirit of all who participate. Some of our Hakalau neighbors and elders cannot come help work so they donate money. Some of our Thai community cannot come so they too donate money for food or send food or hire someone to work in their place. We are extremely humbled by their devotion. Prayers continue : for everyone’s good health – mind & body, for committed united belief in the vision of our Hakalau Learning Center, and deep gratitude that we are blessed to live and work here & to grow strong together. For more information, including how you can participate, contact Akiko Masuda at 963-6422 or msakiko@hawaii.rr.com. ​See also Wailea Village Historic Preservation Community. 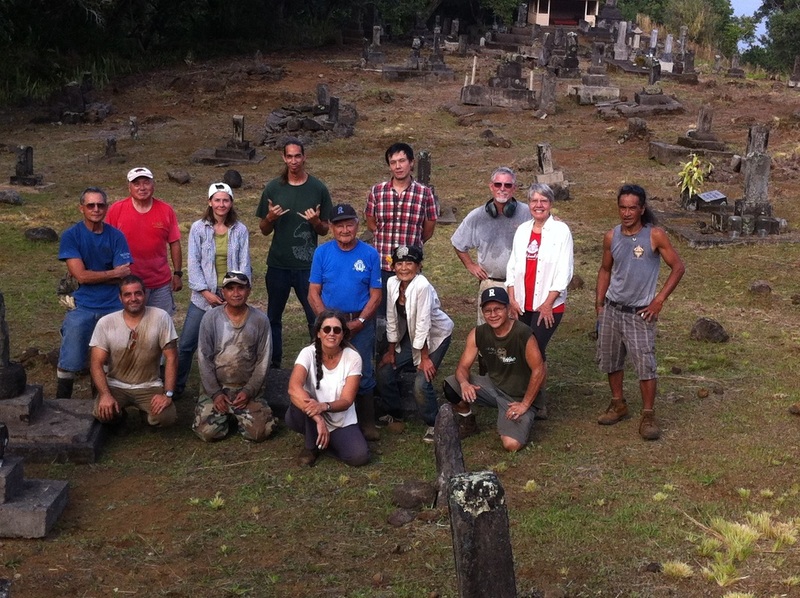 Once a month (the 4th Sunday) we clean Buddhist and Hawaiian Christian cemeteries along the Hamakua Coast. 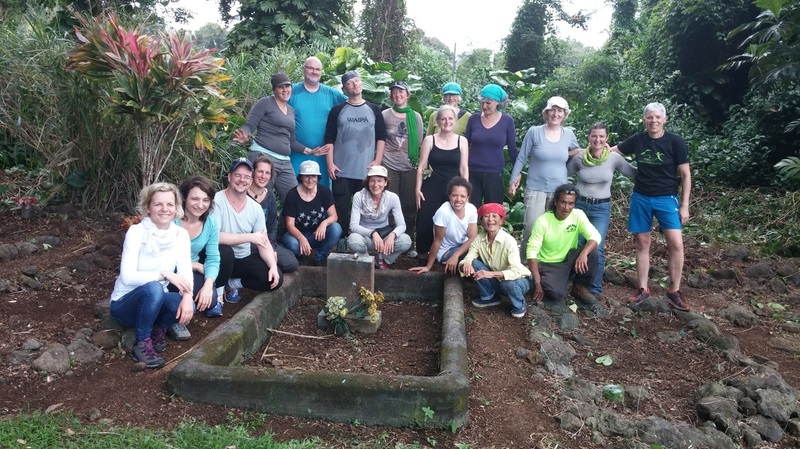 To see the ground, the dirt, at the Hawaiian Christian church cemetery...and simply by steadily returning, we saw the dirt and are beginning to see more. The powerful scene of human beings steadily working, persisting, breaking up the overgrown vines, wheelbarrowing them away...focused...feeling the presence of the ancestors, feeling the ocean breeze cooling us on that beautiful afternoon...a miraculous miracle...quietly we have started the movement, just as we are learning that there are 2-3 people dedicated to other cemeteries, maintaining...regularly. Our vision is your vision – legislation to protect graves of the immigrants – with cemeteries maintained by the community nearby. We continue with prayers that we are setting in motion a “community commitment” to those who came before us, that will start to sprout in communities all over our precious Hawaii – honoring on a monthly basis, those who came before us. As Rick said, this past Sunday was AMAZZZZZZZZZZZZZING! Us “grunt gardener-workers” arrived at 8:45 a.m. with our weed whackers, chain saws, sickles, rakes and whatevas, and the spirit was HIGH HIGH HIGH Octane!! The film team – Chris, Sarah and Robin arrived at the same time and experienced the “before” and “after” and saw how much work can be done in 2 hours by a gung-HO-HO bunch of committed workers who have been working together for at least 7-8 months at O’okala. Someone had widened the trail head immensely, as though anticipating the crowd that was to come....perhaps about 30 plus people, 1 dog – our buddy Mitts, and lots and lots of spirits were present. 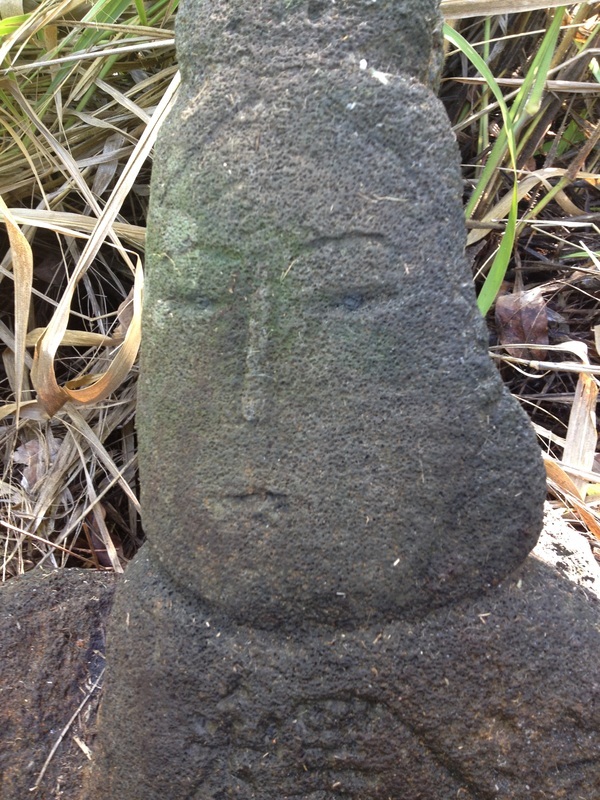 The Honoka’a gangee came to kokua. Gravestones were dusted, brushed and several were set up right and rebalanced. Old tree limbs were cut, and low hanging branches pruned. The goal to get the cemetery ready for family and friends and dancers and Reverend powered us onward. So by 11:20, yard work was done. Workers started bringing in John’s tables and chairs, the Thai ladies ice chests and boxes of curry, green papaya salad, pad thai noodles, Earl’s famous fish head soup and soy beans, and spam musubi and desserts donations and Thai ice tea and and and and...................the abundance and generosity and joy was IMMENSE!!!! Then Rev. Baron from Tenrikyo arrived around 11:30 a.m. and spoke with the Tsukikage Odori Kai group before they trekked down the trail, sharing with them “protocol” for the spirits when entering and departing. Aunty Bea Cabral, who remembers coming to cemetery small-kid-time, came with Walter Ita. Walter decided that he could not come down cuz his legs were swollen, so Aunty Bea took him home and then returned. Clyde and Helen Kobayashi came. Clyde came from the large Kobayashi family and shared stories and memories of the Cemetery and his dad. At HIGH NOON, Rev. Baron began the service to honor the ancestors there. The wind came and cooled us while he performed the ceremony. And then Odori kai danced on the grounds, shuffling the leaves, and by the 5th dance, they were laughing and the leaves were twinkling and we could feel the JOY and CELEBRATION FILL the Cemetery. Here we were: People, from different background and different parts of the world, were honoring the ancestors and celebrating with good food and meeting new friends, and were visiting the graves, yes visiting graves which can been covered up for a long time, and now could see the sun and feel the wind............................WHAT A DAY!!!! Such a great scene – sitting on chairs, eating good food, walking amongst the gravestone, the ocean breezes, the branches swaying, dancing too!!! Mahalo everyone, yes mahalo mahalo mahalo from the depths of our hearts for coming out. Photos courtesy of Deb Scrivens, photographer and devoted cemetery steward. For more information, including how you can participate, contact Akiko Masuda at 963-6422 or msakiko@hawaii.rr.com. See also Wailea Village Historic Preservation Community.